This book defies logic. I can’t seem to decide if that’s the strength of the story. There’s this magical realism quality with its explosive descriptions and the odd habits of the main characters. Part of me wants to view this world through Jude and Noah’s eyes, the intensity with which they view their actions and relationships, to believe in destiny and soulmates, while the cynic in me is smothered by the flowery words and the whimsical nature. But as whimsy as this book is, it is made of pain and these characters are so fucked up. Jandy Nelson’s words crafted this dream like world with a cast of strange, lovable characters. Noah is infections, he had a fascinating uninhibited and wondrous perspective, I adored his character. His mind was wild and colourful and I couldn’t get enough. It was pure magic. His relationship with Brian had me smiling silly and I was rooting for them so much it was disappointing when they story switched perspectives jumping two years forward. It took a little while longer to fall in love with Jude, her older self is much more eccentric while her younger self seemed so hurt, bitter and angry. She’s so vulnerable and lost, I just wanted to protect her but her character growth is badass. While I didn’t love Oscar and Jude’s romance as fiercely as I loved Brian/Noah, their chemistry was WOAH. It was electric and Oscar is so charming. He can charm the pants of anyone I swear and I ate up the banter between him and Jude. 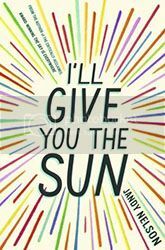 With only 70 more pages left I didn’t know how Jandy Nelson was going to give this story any resolve or happiness, the characters were just drowning in their secrets and guilt. While the payoff was worthwhile, the ending felt rushed and too nicely packaged, Jude and Noah deserved their peace but it didn’t feel realistic that everything could be fixed so quickly. While this book has its flaws, it was definitely a satisfying read and I wasn’t at all disappointed seeing that this was my most anticipated book of the year. There are so many themes in this book that I loved and it’s one of those stories you can have endless discussions about. I’ll Give You the Sun leaves me wanting, it’s how any good book should make you feel.